Three 16-channel, 12-bit pwm PCA9685 chips will operate MOSFET's to switch 48 LED strips. Small sot23 smd MOSFETs (or these); the old ones (P16NF06's) were too overkill, too big. Overkill is still good but there's some math this time. RC batteries for more power: peak 14.8V and 12A no problem, but will be <500mA most of the time. Thinner, lighter LED strips with 120 LED's/m. Arm-based remote control with a 1.3" OLED screen, dials/buttons/sliders/TBD. The remote control will hopefully be a second Arduino-based system, a serial peripheral to the main suit system. 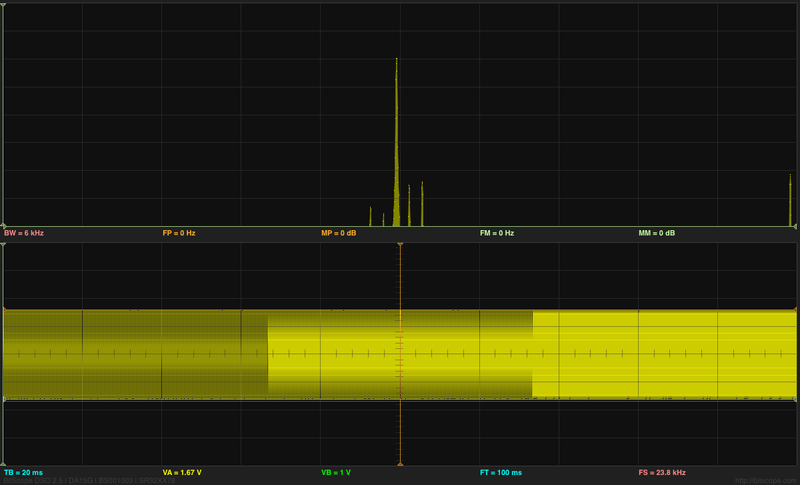 Multi-band audio analysis with MSGEQ7 or a separate Arduino FFT. Most importantly WM is coding Arduino! He already built a complete mode-switching, parameter-adjusting system with a figure diagram on-screen! That display will also help when debugging and building the system. Well, it’s elementary simple in theory, how to do sound localization based on phase difference of signals, that received by two spatially distant microphones. The devil, as always, in details. I’ve not seen any such project created for arduino, and get curious if it’s possible at all. Long story short, here I’d like to present my project, which answer this question - YES! Moreover, quantity of electronics components not much differs from what I’ve used in my previous blog. Compare two drawings, you will notice only 4 resistors and 4 electret microphones were added! All circuitry is just a few capacitors, 9 resistors, one IC and mics. Frankly speaking, writing a remix of oscilloscope, I was testing an arduino analog inputs, keeping in mind to use it in junction with electret microphones in other projects, like sound pressure measurements (dBA), voice recognition or something funny in “color music” series. As they call it – “a pilot” project?. There are some issue (simplest ever) oscilloscope has when doing fast rate sampling on 4 channels (settings 7, 8 and 9 Time/Div ) I already described, so I slightly reduce sampling down to 40 kHz here. Note: *Hardware would be different for arduino boards based on different chips, and must include pre-amplifiers with AtMega328 uCPU. Arduino is capable not only track a MOSQUITO flying in your room, it could tell if it’s MALE of FEMALE !!!!! 4 mic’s split in 2 groups for X and Y coordinate consequently. Picking up 4 mic’s simultaneously is possible, but would reduce audio range down to 5 kHz, so I decided to process two dimension (horizontal and vertical planes) separately, in series. Removing vertical tracking from the code, if it’s not necessary, would increase speed and accuracy in leftover plane, of course. I’d refer you for description of the first and second stages to other blogs, FFT was brought w/o any modification at all. Essential and most important part of this project, stages 3 and 4. Mathematical tutorial on a topic, I’m not any good as a teacher, so you better read somewhere else, to brush up a basic concept. Core of the process is arctangent function. This link says a number of cycles. In two words – too slow. LUT ( Look Up Tables ) is the best solution for no-float uCPU to do complex math extremely fast, and reasonably (?) precise. Drawback of LUT is limited size, so it could be saved in FLASH memory, which in next tern is also limited. This is what I did on “resource management” side: 1 kWords ( 16-bit integers, 2 kBytes) , 32 x 32 ( 5 x 5 bites) LUT, scaled up to 512 to get better “integer” resolution. There are a few values in top-right corner, that melted together as their differences are less than “1″ (not shown on the picture on right side). The “worst” resolution is in top-left corner, where “granularity” is reaching 256, or unacceptable 50% of the dynamic range. To stay as far away from this corner, I put a “Rainbow Noise Canceler” – single line with ” IF ” statement, which “disqualifies” any BIN with magnitude, calculated at the FFT stage, lower than 256. I called it “Rainbow” because of it’s shape, “red line” is an arc, going from 16 on top line to 16 on left side. Also, “Gain Reset” – 6 bit ( depends on the FFT size, has to be 6 bits for 128) reduced to 5 bits, in order to get better sensitivity. This two parameters / settings, 5-bit and 3.5 bit magnitude limit, create a “threshold” for weak spectral peaks. Basically, depends on application, both values can be adjusted in different proportions. There are two category of tracking technics, with mic’s installed on moving platform, and stationary mic’s. First one is a little bit easier to understand and build, requires Relative direction to sound source. This what I’ve done. Stationary mic’s approach, when motors are moving laser pointer (or filming camera) alone, would require Absolute direction to sound source, and must include stage #5 – angle calculation via known delay time. Math is pretty simple, acrsine function, and at this point only one calculation per several frames would be necessary, so floating point math wouldn’t be an issue at all. No LUT, scaling, rounding/truncation. Elementary school geometry knowledge – thats all you need. Subtraction phase value of one “qualified” mic’s data pull from another, produce phase difference. To turn phase difference in delay time, division by BIN number is performed. Lets call this operation “Denominator” process. The denomination is necessary, because all data after this step going to be combine and process together, doesn’t matter of wave length, which is different for every bin. Frequency and wavelength related to each other via simple formula: Wavelength = Velocity / Frequency, where velocity is a speed of sound wave in the air ( 340 m/sec at room temperature). As distance between two mic’s is a constant, sound with different wavelength ( frequency ) produce different phase offset, and denomination make them proportional. (WikiPedia, I’m sure, would explain this much better, mind you, I’m a Magician, not mathematician). First picter on right side shows ”Nuisance 3: Incorrect arctan” correction. You will find two lines with “IF” statements in the code relaited to stage #3. Second one, gives you idea why other correction at stage #4 is necessary As you can see, subtraction one arctan from another generates a rectangular “pulse” ( Diff. n. corr., violet line) whenever one function changes sign but other (delayed version) not yet. Light blue line (DIFF(B)) doesn’t have such abnormality. Math is simple, just two lines with “IF’s” in the same manner, only “double size” constants this time. 2048 on my scale corresponds to 2 x PI, 1024 – PI, and 512 – PI / 2. To fight reverberation and noise, I choose a Low Pass Filter, which I’d call here as a “Rolling Filter”. My research with regular LPF, shows that this class of filters is completely NOT appropriate for such type of data, due their high susceptibility to “spikes”, or sudden jump in magnitude level. For example, when system getting steady reading from 2-3 test frequencies with low values, let say -10, simple averaging ( should be -10 ) results will be corrupted with one accidental spike (magnitude +2000) during next 60 – 100 consecutive frames !!! The Median Filter doing well eliminating sudden spikes, the same time is very hungry to CPU cycles, as it’s using “sort” algorithm each time new sample was arrived to the data pull. Having 64 frequencies, and setting filter kernel to 5 – 8 samples, arduino would be buried doing sorting at almost 40 ksps. Even processing each frequencies data not individually, and sorting only one 64 elements array still very time consuming job. After thinking a while, I came up to conclusion, that “Rolling Filter” has almost the same efficiency as Median, but instead of “sorting” requires only 1 additive operation! On long run, the output value will “roll” and “stick” to the middle of the pull. ( Try to model it in LibreOffice. ) Adjusting “step” of the “Rolling Filter”, you can easy manipulate responsiveness, which is almost impossible with Median Filters. (Things TO DO: Adaptive Filtering, real time adjustment depends on input data “quality”). To be continue…. Video will follows ! ( Predicting your question, how “good” is localization? Its about same, as Laser TRF (tracking range finder) has, look at other blogs for now to get impression. In other words: ASTONISHINGLY GOOD, a few (1 – 5) angular degree in closed environment. Link to Arduino (Leonardo) sketch: Localizator-beta-9. Audio VU meter (AC microVoltmeter) with Extra wide Dynamic Range 69 dB. O’K, after having some fun with stereo version of the VU meter I described in my previous blog-post, now it’s time to do a serious stuff. Studio grade VU meter !!! 24 steps, equally spaced every 3 dB, covering Extra wide Dynamic Range from -63 up to +6 dB. Single (mono) channel this time, no messing around, absolute precision at the stake. Plus, it keeps absolutely Top-Flat linear frequency response from 40 Hz up to 20 kHz(*). DR = 1.77 + 6.02 x B = 1.77 + 6.02 x 9 = 55.95 dB. but, unfortunately, isn’t rail-to-rail type. 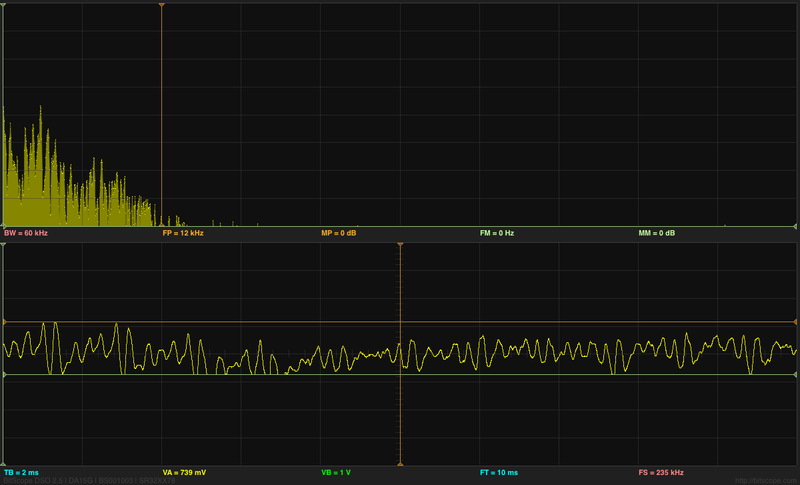 Test results show, that compression become noticeable (~1 dB) when not scaled magnitude approaches level about 50 dB. That is in good agreement with observed on oscilloscope not distorted deviation peak-to-peak 2.5 V. Or only half of full range of 5V. And as theory says, half is one bit less, and real DR = 1.77 + 6.02 x 8 = 49.93 (~50 dB). In second, audio data is processed on “block” structure basis. It means, having average of the block 50 dB, doesn’t mean that there was no spikes in the sampling pull, that obviously would be clipped and introduce error in the measurements results. This phenomenon is defined as Crest Factor. Different sources estimate crest factor of musical content between 10 – 20 dB. So, taking direct approach, Arduino with OPA mentioned above as front-end could accurately cover only: 50 – 20 = 30 dB. To get wider dynamic range, I have to scale input amplifier gain, and this is exactly what I did, building amplifier in two stages and selecting one cascade (by-passing second one) or two cascades using internal ADC multiplexer. As there is no switching IC in analog signal path involved, gain is defined with high stability, could be one time precisely measured – calibrated via coefficient stored in EEPROM (nice feature to add). On the right side there are electrical drawings of “slightly” modified kit, where stereo amplifier was converted into 2 stage mono version. First stage, with gain about G1 = 1 + 10 k / 1 k = 11 is necessary to “bump-up” line-level signal, to create DC bias required for correct operation of the ADC, and also served as buffer to lower signal source impedance, as it seen by ADC input. I set a gain of the second stage amplifier at 40 dB: 20 x Log_10 ( G2 ), where G2 = 1 + 100 k / 1 k = 101. IMHO, setting gain limit for only 30 db per stage as it follows from paragraph above, is overkill, and would be justified for “real-time” radio broadcasting or audio processing for storage media, when high fidelity of audio program must be preserved. For visual display “clipping” of bursts in signal is not noticeable at all due high refresh rate of display, 78 Hz. Human just can’t see, if LED lights-up with such speed. For steady AC amplitude measurements (micro Voltmeter mode) this is not a problem at all, and headroom as small as 3 dB would be sufficient, leaving wide 47 dB per stage. Basically 14 is a noise flour of my analog front-end. Approximately 51 micro volts AC is turning on first LED bar. Look at the table, which reflect my current hardware set-up. * Other things to keep in mind, there is a “gap” 78 Hz wide in frequency range at 10 kHz, It introduces a small error, about 78 / 20.000 = 0.39% in white noise measurements result. For musical content, which has really low power density level at 10 kHz, magnitude of error would be much lower, probably, less than 0.05 %. 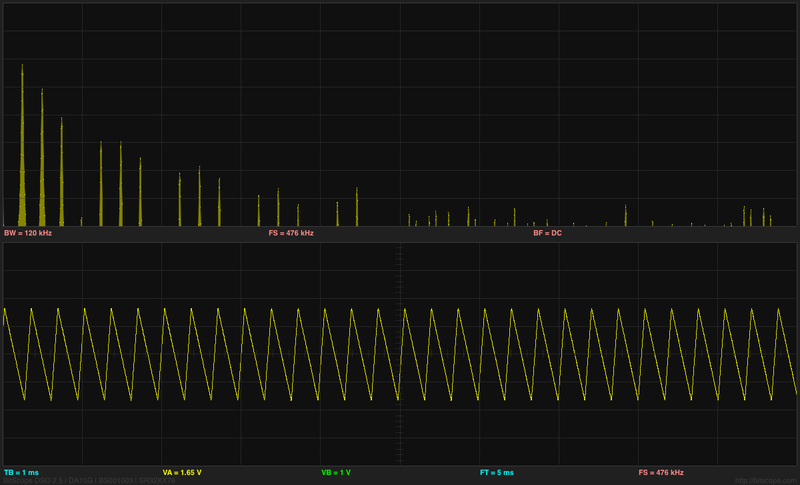 Running FFT in code creates great opportunity to reject any interference in the audio band. For example, if there is a noticeable hum from electrical grid lines in the content, issue easily could be fixed NOT including bin in final sum of magnitude calculation. Though to make it works more efficient, some adjustment in sampling period would be necessary, setting bin frequency precisely at 50/60 Hz. One more advantage of having FFT based filtering (primary mission is HPF, look in stereo VU meter, how long kernel of the FIR filter has to be otherwise), is great opportunity to create “weighting” A, B, C or D curve for audio noise measurements. (:TO DO). Fast update rate of visual output. To process stereo input, this time arduino is switching ADC multiplexer every time when it finish sampling input data array (size=128). Two channels “interleaved” with frame rate 78 Hz, so during each frame only one channel sampled / processed, and update rate per channel is equals to 78 / 2 = 39 Hz, which is more than enough for most audio applications. 1. Sampling rate in this application is 10 kHz. How I achieved 20 kHz stated in objective section, doing sampling only 10 ksps? >>>Aliasing!<<< What is considered to be nightmare when we need spectral information from FFT output, aliasing in this project is really helpful, reflecting all spectral components around axis – 10 kHz back “to the field”. As all bins going to be sum-up there is no issue, only benefits. Due aliasing, I’m able to use low sampling rate, and reduce CPU workload down to 52%. 551 coefficient to be multiplied and sum up (MAC-ed) every 100 usec! No way. I’m not sure, if it could be done on 32-bits 100 MHz platform with build-in MAC hardware, but there is no way for 8-bit 16 MHz Arduino. IIR filter wouldn’t make much difference here. It has lower quantity of multiplications, but more sensitive for truncation and rounding error, so I’d have to use longer (32-bits?) variables, which is not desirable on 8-bit microprocessor at all. And here comes FFT Radix-4, which easily fulfill this extra-tough requirements in the most efficient and elegant way. All I have to do, is just NOT include bin in final sum, and all DONE!. TOP-FLAT linear frequency response 40 Hz – 20 kHz ( -3 dB ), with complete suppression of DC, and low frequency rumble below 20 Hz attenuation. Linearity is better than +-1 dB between 80 – 9960 Hz. Link to Download a sketch: Stereo_VU_Meter. Modified Stereo VU meter, Logarithmic scale, 8 bars per channel, spacing 6 dB. Dynamic range: 8 x 6 = 48 dB. Stereo_VU_Meter(Log10). Next blog: Extending dynamic range to 72 dB! Video clips on youtube, arduino is running simple demo application. Tears of Rainbow BarGraph HD movie " href="//www.youtube.com/watch?v=30ELYwyy4JQ&feature=youtu.be]" target="_blank">BarGraph movie. low price on hardware, no special display driver IC. To simplify assembly work, I decided to buy RGB Led Strip. I had known, from my first project, that design would be composed with straight lines, and the longer lines means the more LED’s ( and consequently, soldering work). For comparison, one line on this display consist of 6 RGB leds, or 24 soldering connections. Using RGB strip, I reduce a workload 24 to 4, or 6 times. I envy to people, who have a patience to build 8x8x8 RGB led cube (or even 10^3 !). Addressable RGB strip would make life even easier, but I couldn’t find local re-seller, and was not going to wait shipment / customs. It’s summer time! In order to easy reconfigure a style, for example, from 3 BarGraphs, needed in Color Music exposition, to just 1 GIGANTIC VU meter (*), RGB led strip is chopped-up and attached to 3 rectangular shape plates. I find out, that for some reason strip isn’t “sticky” enough, and to keep its perfectly align on a plate, I used a tire-ups at both ends. Luckily, it was quite easy to punch a holes in the plates for tire-ups just using kitchen knife. (I had such idea initially). Something to think, if you plan to work with a strip in your design. The same also true for wiring (32 wires per plate). Tin “cookie” plates just was made to be part of this project! And I even did not mention the heat dissipation, 1/3 of 5 meters strip consume around 12 W of power, it’s almost like my soldering iron! One more things before I forget, I installed 1 cm paper pads to insulate contacts from the metal plate in the middle and on one side. Heat shrink tube takes care of the other end. LED’s use 12V as power source, and as I need a lot of PWM channels to control their brightness , here comes 74HC595 buffered by ULN2803 at the outputs. Nothing special, 9 shift registers daisy chained to produce 72 PWM outputs. Two IC in a pair installed in reverse on a prototype board, to minimize a number of interconnections. As you can see from the picture, there is only 1! yellow jumper brought from pin 15 of the shift register to pin 8 of the Darlington array. Why they don’t make a shift register in DIP-16 package? There wouldn’t be any jumpers at all! Other alternative is using TPIC6B595. * For clarity, schematic diagram shows only two pairs of chip, and half length of the strip lines. There are on-line libraries available, to drive 74HC595 by arduino. Only some of them not using hardware “build-in” SPI interface , and really slow in communication with peripheral IC’s (don’t forget, that LED display only second part of the project, the first one, FFT, is very time consuming). The others libraries, nicely written and perfectly optimized for speed, have too much functionality, that I don’t need in my project, plus they are memory demanding. On the other hand, I need low resolution animation function – sliding down colorful tears, that I have to create on my own. Now I ‘d like to represent a code, very fast SPI subroutines, completely written in C ! Function shift out 9 bytes ( for 9 shift registers in this project ) approximately in less than 36 usec, or 0.5 usec per one PWM channel. One bit-set in the unrolled loop is about 4.5 cycles. FFT part of the code completely “copy / pasted” form my “Radix-4″ blog. Here an advise, if you wish to explore the code, look there for “pure” form of function. What is new in this publication, is magnitude calculation subroutine, without slow SQRT. Bar Graphs “set position” sub-function, or mapping height of lighted area of a plate to integral sum of the bins, brought into this project with mild modification from first project. Continue moving from LED’s display to audio input, I should say couple words on a sampling. There are two functions in the project, that have to be triggered periodically with a timer, “display refresh” posted above and “take ADC sample”. It looks logically, instead of having two timers and have a lot of troubles with collision / racing between them, to scale both function to the same time frame, and execute them at once. “Display refresh” rate equals to minimum rate just to avoid flickering (60/70 Hz) multiplied by the numbers of brightness level. For example, setting brightness step number to 256 ( which provides excellent 256 x 256 x 256 = 16 M colors ) would require periodicity 60 x 256 = 15360 Hz. See, where I’m driving at? Exactly, 15 kHz is nice frequency to sample audio input!. Well, it’s not 44.1 kHz as default settings Hi-Fi audio standard would recommend, but I ‘m not using all sound data in this project, as I only interested in lower 2 kHz part of the spectrum. And BTW, it’s almost 4x times higher than bear minimum prescribed by sampling theorem (Whittaker–Shannon–Kotelnikov). I’ve made my choice at 15.625 kHz, to simplify math of binary compare to 64. ( 1/64 usec = 15.6 kHz) If there is no big difference, why not pick up “lucky” binary number, and help a Timer to do his job? O’K, there is TIMER1 available. As project already have been heavily “over-loaded” on software side, I decided to take TimerOne library and not bother myself this time with a bunch of registers, interruptions, masks, etc, leaving this out of the scope, as not related to subject. FFT size =128 provides extra fine resolution for Color Music performance. BTW, may be it not obvious, but bigger size of FFT has LOWER CPU workload per sample. And last, after everything was melted in one (BIG) sketch nothing happened. No, my arduino can’t catch up at 15.6 kHz. 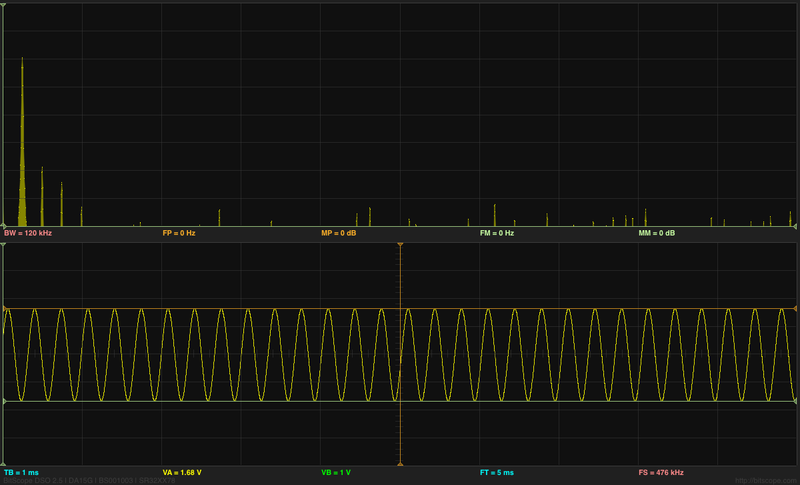 Shifting 9 bytes via SPI, as I mention earlier, takes 36 microseconds. It’s leaving 64 – 36 = 28 microseconds per sample for everything else, or 28 x 128 = 3 584 per frame. Radix-4 (size = 128) takes 4.2 milliseconds, as I posted here. Alright, hell with it, who need 16 M colors on 8 x 3 led display, by the way? So, I bring quantity of brightness steps down to: 256 / 4 = 64, which is more than enough -> 262 144 color combinations! QUANTUMS definition sets coefficient 4 in SPI sub-function. The same time frame rate equals to 122 Hz, which is 2x times higher, than 60 Hz I started my calculation with. Default color map, or bin’s assignment to a specific plate, is shown above. This time I implemented a command in CLI to make adjustment in this map on the fly, according to music style, equalizing all three bars more or less proportionally. Automatic Gain Control loop implemented in first project, doesn’t work so great with bigger display size ( first project uses 4 lines per color ). Plus, AGC bringing noise in the visual performance in pauses between two songs and in quite fragments of the music. Starting bin position for each RGB plate could not be changed using CLI ( you still can do this modifying the scetch), but quantity of bins accumulated per plate could be adjusted simply sending “dr” for red, “dg” – for green, and “db” - for blue, where d is a digit 0..9. Bands could over-lap, which is not desirable, in this case red is limited too 0..3, green 0..6, and blue 0..9. More on the audio input hardware and sampling software subroutine, I post in separate blog, as this part follows w/o much modification thorough a few previous blogs, and doesn’t need to be re-stated here. *Note: in software G.VU is not implemented yet. Link to download a sketch: Tears_of_Rainbow. Makers need to familiarize themselves with the core concepts and the theory involved in creating applications such as Motion Sensing and Face Tracking. As the technology is churning out new hardware day and night, DIYers need to work hard to keep up and always be in touch with the latest technology around them. For example, anyone working with Accelerometers/ Gyroscopes or Inertial Measurement Units needs to understand the theory of Vectors, Force, Gravity and be able to work out complex mathematical problems. They may easily get an Arduino Board and an Accelerometer Breakout or an IMU Board and use a library instead of writing their own code but to truly understand the theory behind it; how the device actually works, is not for the faint of heart. One such problem is the Face Tracking Application. Unless you know the real theory behind how the Algorithm actually works, you can only wonder about that robot which follows its master. Greg Borenstein had an idea of creating a website dedicated to this issue. Makematics – Math for Makers. More and more people should step forward and create or compile a good amount of research data to help fellow makers and DIYers in solving complex mathematical problems.